The 18th edition of the Hout Bay Trail Challenge attracted some of the best trail runners in the business for an epic race day. 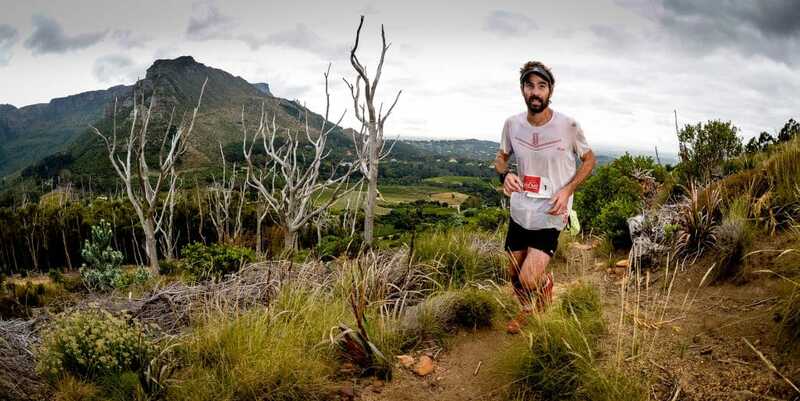 Staged as the official South African Trail Championship in 2019, the 40km course was moved from its familiar mid-winter date, changing the nature of the battleground somewhat. The day dawned mild and misty, the Hout Bay Harbour and its salty smells and industrial sounds setting the scene at the start line. Runners were split between batches, with the elite crew heading out in A Batch shortly after 6:30am. The Hout Bay Trail Challenge circumnavigates the mountains surrounding Hout Bay. The route is fully marked, and can be taken on as an individual, or in a team of three. Leg 1 takes runners from the harbour to Suikerbossie via Suther Peak, where a festive gathering of supporters, aid station volunteers and traffic controllers were ready to welcome the front runners in after their first 14km. First runner in to Suikerbossie was current record holder and twice champ, Kane Reilly. His experienced support crew, led by Mama (Maxine) Reilly was ready to assist him with a slick transition in to leg 2. Kane had limited room to breathe with Johardt van Heerden less than two minutes behind him, and Siviwe Nkombi around 30 seconds behind Johardt. Podium hopeful, Rory Scheffer, wisely withdrew at this point as the flu he had been battling caught up with him. The elite teams were burning rubber, too. First team to arrive was the Altra Vets, led by Pete Calitz who handed over to Martin Kleynhans. Just off their pace, speedster Bianca Tarboton of Salomon Ladies cruised in to hand leg 2 over to Hayley Preen. The women’s race was equally stacked, and Landie Greyling led the initial charge, coming in to Suikerbossie only seconds ahead of Nicolette Griffioen. Landie, back racing after the birth of her son just months ago, was welcomed by a beaming Christiaan and baby Christopher Greyling. Both women moved through the first checkpoint swiftly, with Naomi Brand cruising through in third position behind them. Leg 2 took runners up Llandudno Ravine, across Table Mountain via Woodhead Dam, and down to Constantia Nek. Kane Reilly maintained and extended his lead, not far off record pace by the time he had arrived at the Nek. Johardt remained in second, and Timothy Chambers pulled in to third. Siviwe Nkombi withdrew from the race with a hamstring injury. Hayley Preen brought the Salomon Ladies team in to the Nek in first place, handing over to Kristen Heath. Team Altra Vets was not far behind, and Stephen Davis flew out to conquer the final leg. 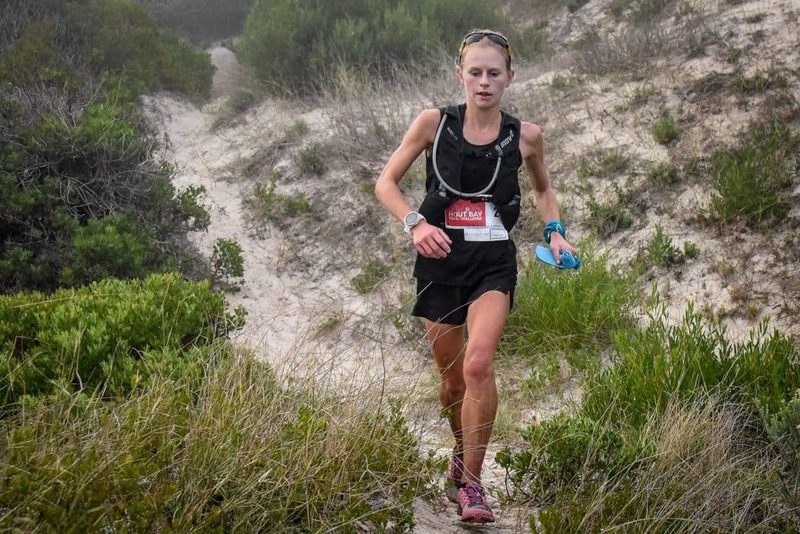 Nicolette Griffioen had established a solid lead by the time she came through the Nek, with Landie looking strong in second, and Naomi maintained her pace, giving it stick on the climbs, to continue in third position. Leg 3 is notoriously brutal, with a few classic HBTC surprises in the mix. It runs from Constantia Nek back to the Hout Bay Harbour, via Vlakkenberg. A final 1km of beach, which many runners run barefoot, is the last hurdle. The community was out in force with kids, dogs and families ready to cheer the heroes home. As photographers and supporters waited eagerly at the harbour, word from the course was that there had been a few upsets along the way. Kane Reilly did not let go of his lead, taking the win in 4h05. Timothy Chambers was second in 4h25 and Thabang Madiba had a cracking leg 3, placing third in 4h29. A visibly shattered Van Heerden came in fourth. Family and friends were alerted to Kristen Heath, of the Salomon Ladies, having gone off route according to indicators from her tracker. It was later confirmed that she had to receive medical treatment after collapsing on the first stretch of beach, resulting in a swift transfer to an ambulance and then hospital. Thankfully Kristen is recovering well. The first team across the line was the Altra Vets in 4h25 followed by The Vine Men in 4h35 and Ebb and Flow in 4h51. Nicolette Griffioen took the win in 4h58, with Landie beaming across the line in 5h04. Naomi Brand was equally ecstatic, coming in third in 5h14. The first women’s team was Team Raidlight, and first mixed team went to Julie and the Boys. Generous prizes from The Vine, Tailwind South Africa, Bamboo Warehouse and Dunlop were handed over. MYO2 Recovery Gel supplied free massages and each finisher received beautiful coasters made from bamboo. Weary warriors continued for many more hours, peeling themselves off Vlakkenberg towards the glory of the classic HBTC finish line, where cold beer, burgers and fresh fried fish mingled with good tunes and friendly faces. At the end of a long day, with temperatures in the high 20s, the beach lay scattered with runners in various positions of recovery after a welcome dip in the chilly Atlantic. To quote the champ and one of South Africa’s finest examples of solid sportsmanship, “From the passion of the supporters to the attitude between all the runners dicing for top spots, safe to say the sport is in a good place”- Kane Reilly.